Where Jim Derry shares his passions, knowledge, and experience about neat and interesting things related to technology. This is an organized blog that’s based on only a few simple themes. As such follow the categories that interest you and ignore the ones that don’t. The most recent articles is always on this page, regardless of its category. If you came here to learn how to program something with Cocoa and there’s only an article about cooking with cocoa on this page, then have a look at our categories. The complete change log, as usual, is available here. In many ways, this is a small release, but in some ways it was huge. The first thing you’re likely to notice (if you’re running Mojave in Dark Mode) is Balthisar Tidy’s Dark Mode support. If you’re using Balthisar Tidy in Dark Mode, some feedback on the text editor theme would be appreciated. I can make tweaks to the colors if they’re not as usable as you’d like. If you’re using Balthisar Tidy for Work and would like to contribute some Dark Mode schemes, feel free to send me your scheme files, or simply post them in the comments below. One further note about Dark Mode: Balthisar Tidy remembers your settings for each mode as you switch between them. This applies to most items in the Editor Preferences panel, and the Colors Preferences panel on Balthisar Tidy for Work. This release also updates the W3C Nu HTML Checker to version 18.9.16, and the built-in Java JRE to 10.0.2. Because the JRE is huge, it’s unlikely that I will continue to update it, unless there are security concerns or the Nu HTML Checker stops working with the current version. The reason for this is that it’s in version control as a binary, and this inflates the history substantially. If anyone has any recommendations to this end, then it would be appreciated. Balthisar Tidy, of course, uses a lot of free and open source software. While the use of HTML Tidy and the Nu HTML Checker are obvious, some pieces of the main functionality are from other projects as well. This helps prevent reinventing the wheel. The three main components that I use (but didn’t write myself) are modern Fragaria, MMTabBarView, and DCOAboutWindow, and none of them had any Dark Mode support. (The web-distributed version uses Sparkle, too, but it was already Dark Mode ready). 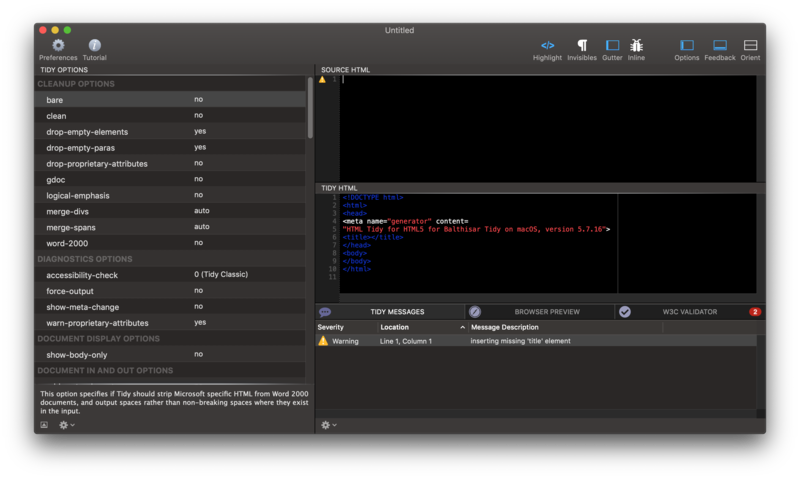 Given how modular software is these days, and the popularity of these frameworks, I wonder just how quickly other macOS projects will be available in Dark Mode? Or perhaps, is the problem Swift? All of the frameworks that I mentioned are written in Objective-C, and although Objective-C works perfectly with Swift (Cocoa is Objective-C, after all), it seems that the popular thing to do is take something the works perfectly, such as MMTabBarView, and write a new implementation in Swift, just because. In any case, the three frameworks that I mentioned all work quite nicely in Dark Mode now. Check out their respective commit histories to learn why!